A Muslim Child is Born: Ramadan Charity Game: "Sadaqah! Sadaqah!" Ramadan Charity Game: "Sadaqah! Sadaqah!" With Ramadan fast approaching, sister Umm Yusuf, like many other sisters, is planning for ways to help children get the most of this Blessed Month. She asked if I could post a game/activity about charity. Sis Umm Yusuf, this is what I have come up with but if it is not what you had in mind please do not be shy to tell me and we can discuss more so I can try to post an activity that was closer to what you had in mind insha'Allaah. This game is called, "Sadaqah! Sadaqah!" The objective of the game is for children to learn to give away things that they may usually be inclined not to give to someone else willingly due to their affection for the object or food. 1). Explain to children that during Ramadan we compete in doing good deeds and race to give sadaqah. Explain that we do this seeking the Pleasure of Allaah Alone and His Noble Face. Tell them that they will have a chance to practice giving away things, for the sake of Allaah, that they may wish to keep. 2). After cutting out and assembling the number cards and "Sadaqah! Sadaqah!" cards (there are 25 game cards and 10 number cards and 2 "Sadaqah! Sadaqah!" cards),shuffle the number and "Sadaqah! Sadaqah!" cards (together) and place them face down on the floor. 2). Shuffle the game cards and divide them among each player evenly, if possible. Extra cards can be set aside insha'Allaah. 3). Players take turns taking a number card from the stack/deck. Whichever number they pick, they must give that number of their own cards away to the player to their right. They can choose which cards they wish to give away (as long as it is the amount on the card they picked) but this may mean that they end up with a lot of cards by the end of the game. They must train themselves to give away that which they like. If they pick a number that exceeds the amount of cards they have, they return the number card to the stack and the next player takes their turn. 4). If a player picks a "Sadaqah! Sadaqah!" number card that has no number on it and only a money bag on it, they can keep the card and this gives them the right to decline taking cards from any player once only. They have the option to choose another player who will receive the cards and that player must take the cards. After a player has declined once, they must place the card back into the stack/deck (at the bottom or in a random place). They must accept cards from the next player who gives them cards because they no longer have the "Sadaqah! Sadaqah!" card in their possession. 5). The winner is the player who gets rid of all of his/her cards first (i.e. gives the most sadaqah). 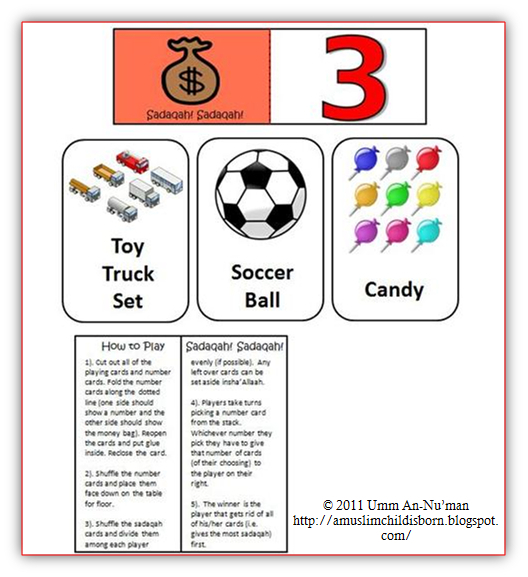 The file includes, directions for play, 25 sadaqah cards, 10 number cards, and 2 "Sadaqah! Sadaqah!" cards. **If you and your children play this game, please take pictures (without any people or animals in the picture) and perhaps we will have several guest posts from readers and their children about their experience with the game insha'Allaah** Please email me with your pictures and post insha'Allaah. mashaAllah! i look forward to playing this game with my children and see how they practice giving "sadaqah! sadaqah!" Mashaa Allah...what a beautiful look! Jazaki Allahu khairan ukhti! @ Umm Sanaa: jazakillaahu khayr Umm Sanaa. Insha'Allaah, you and your family enjoy the game.